The third in French writer/director Cédric Klapisch’s occasional series of films following the life and loves of writer Xavier (Romain Duris) continues on from Pot Luck (2002) and Russian Dolls (2006), and is as slick, fun and ultimately insubstantial as its predecessors. The film begins with the now 40-year-old Xavier following ex-girlfriend Wendy (Kelly Reilly) from Paris to New York so as not to lose touch with their children. The location change prompts him to ponder where his life is now headed, as he meanwhile struggles to write his new novel. Initially slumming it on the sofa of old friend Isabelle (Cécile De France), Xavier gets drawn into her relationship woes and then, as if this weren’t enough, his old flame Martine (Audrey Tautou) shows up, prompting him to wonder if perhaps she was the right one for him all along. It makes for an entertaining confection in Klapisch’s able hands, but there is nothing particularly fresh here. The director sticks closely to his stylistic approach in Russian Dolls, incorporating fantastical flights of Xavier’s imagination – chiefly some funny discussions with long-dead German philosophers Hegel and Schopenhauer – and again using the charachter’s encounters with his exasperated editor as a way of commenting on the film’s own convoluted approach to storytelling. Klapisch’s real-time approach to the story – picking up with these characters 8 years on from the last film – suggests an aim similar to Richard Linklater’s Before… films, to capture an authentic picture of relationships developing over time. 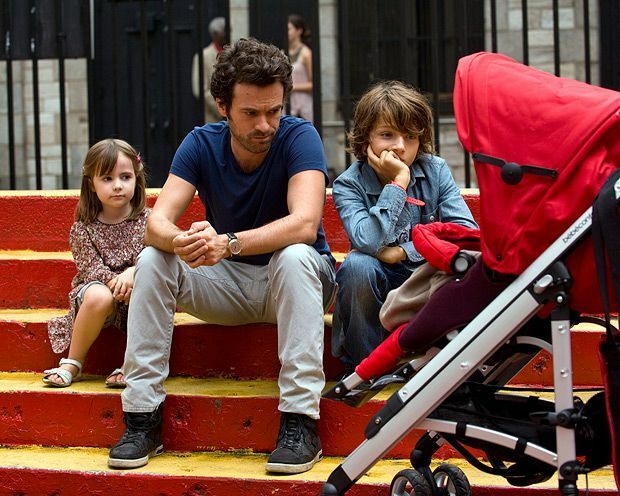 But where Linklater’s films are marked by naturalistic improvisation, Chinese Puzzle is so intensely contrived that it fails to touch on the deeper truths Klapisch seems to strive for. Xavier pauses to ask a lot of big questions, but the farcical turns of plot undermine any serious attempts to suggest answers. General release from Fri 20 Jun. A 40-year-old father of two finds life very complicated. When the mother of his children moves to New York, he can't bear them growing up far away and so he decides to join them.